People keep coming into Sam Ackerman’s car dealership and asking him about the deals under the federal Cash for Clunkers program. Which normally wouldn’t be a problem, especially after the government last week tripled funds for the program, which offers rebates up to $4,500 for drivers who turn in certain old gas guzzlers and buy a new ride. Except that Ackerman is sales manager at the Pre-Owned Department at D&E Dodge in Wilmington, N.C. That means he sells used cars. “Probably 1 out of 3 customers that pull in the lot are asking about it,” he said, but he has no rebates to offer. Only his competitors who sell new vehicles can make a Cash for Clunkers deal. “Yeah, it’s an unfair advantage they do have,” Ackerman said. Cash for Clunkers is rolling on after President Barack Obama signed a $2 billion extension for the program last week, and new car dealers say buyers are continuing to flock in for the deals. But at the other end of the market, companies and organizations whose business models are built on used vehicles say they’re hurting badly as Americans who might have come to their doors suddenly find themselves better placed to afford a shiny new car. It isn’t just dealers, who say their customers are disappearing. It’s also auto parts businesses, which fear that the cost of used parts could skyrocket as clunkers are destroyed rather than sold for parts. And it’s charities, many of which depend on donated cars to raise cash at auctions. For every new vehicle sold under the federal rebate scheme, which began July 24, a used one is turned in. It can’t be resold, because its engine must be destroyed to make sure it doesn’t keep polluting the air. “I think it’s the worst thing we’ve ever done,” he said. Kelley Blue Book projected last week that the newly expanded Cash for Clunkers plan would take at least 750,000 used autos out of the marketplace — a nearly 5 percent contraction in supply based on 2008 inventories. That’s enough to have “an immense impact,” inflating used car prices and leaving lower-income buyers behind, said Alec Gutierrez, KBB’s senior analyst of vehicle valuation. With economists projecting inflation of as much as 15 percent in used car prices, dealers say they’re already feeling the impact. Eric Moore, president of Excalibur Auto Group in Kennewick, Wash., said he was seeing sharply reduced inventories at auctions where dealers buy entire lots of used cars. “The prices at auctions are tremendously higher,” Moore said. When Jeff Carlson, owner of Warehouse Auto in Waterloo, Iowa, heard about the program, “my first thought was, what in the heck is the government doing here?” he said. Taking old cars out of the market doesn’t reduce inventories just for used car buyers and sellers. It also squeezes the supply of auto parts for mechanics and engine-component retailers. For “the person who can’t afford a new car and they want to rebuild their car, well, we don’t have those [engine] parts to offer them anymore because they’re destroyed,” said Chris Clos, general manager of Abco Fridley Auto Parts in Fridley, Minn., near Minneapolis. The bottom line, said Norman Wright, chief executive of Stadium Auto Parts in Denver, is that the program will most hurt the people who can least afford it: lower-income Americans. “A lot of low-income people can’t afford any other type of car, and if there’s a shortage of those engines and their vehicles need one, then those people are going to have a hard time finding a recycled engine to get their car back up and running,” Wright said. And when those people turn to charities for help, they may not get it. At Northwest Charity Donation Service in Tenino, Wash., volunteers sell donated used cars to raise money for more than two dozen local public service organizations. 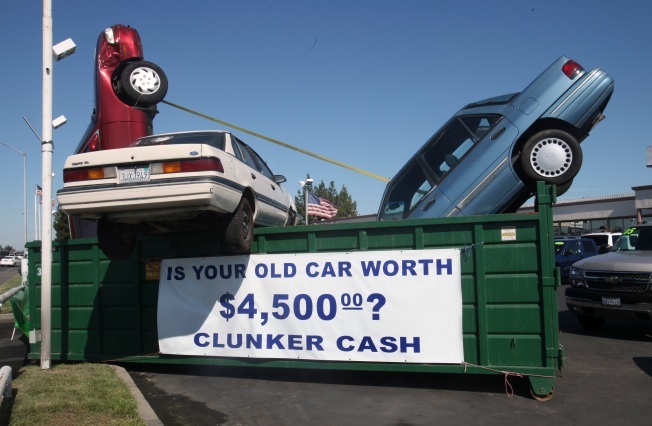 Since Cash for Clunkers got under way, donations have fallen by nearly 50 percent, it reported. Jeanne Jelke, executive director of the Benton-Franklin County Chapter of the American Red Cross in Kennewick, Wash., relies on donated used cars not only to raise money but also to distribute to clients who don’t have transportation. But now, would-be donors are “thinking I might be able to get more money for that at the new car showroom then I can as a tax deduction,” she said. The Make-a-Wish Foundation sells donated cars to raise money to fulfill the dreams of terminally ill children. At the foundation’s chapter in St. Louis, “when we found out about the program, it was a red flag,” said Krista Goszewski, the local fundraising coordinator. “That is a lot of potential revenue that could come to our vehicle donation program, and it was kind of scary to hear news like that,” Goszewski said. For many dealers and public service administrators, Cash for Clunkers is a two-edged sword. The program helps a lot of people and businesses, they say, but the damage it does to their interests is hard to accept. “I understand that people are getting a good deal in the car showroom, and I realize the car manufacturers need the help,” said Capt. Eric Wilkerson, administrator of the Salvation Army in Portland, Ore.
For now, dealers and charities say they’re rolling in reverse while they anticipate the end of the program.